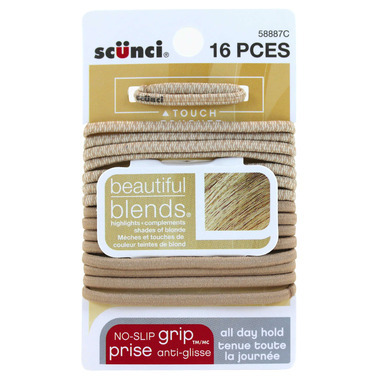 Scunci No-Slip Grip Hair Elastics are a necessity to keep on hand or in your purse. These metal free hair ties will save your hair from damage while providing long lasting hold. Love the colour of these, but the no-slip grip falls off after a few uses. Disappointed. Strong and durable! Wish it was a little thicker but otherwise great size! These elastics do a very good job of holding my very thick hair. I haven't even had one snap yet which with other elastics I usually only have about a 50% success rate. I always wear my hear up in the "mom bun", and these guys keep it in place, and don't slip. The colours blend in nicely with my hair, and they last a long time. These are the best hair elastics. Period. I can't find these in any stores in Canada so I was over the moon about finding these online. The service was quick and I received them in a timely manner. I'll definitely be ordering them again. Thanks well.ca. I thought all hair elastics were made equal and nothing to write about...I was wrong! I have been wearing hair elastics my whole life and these Scunci are different. It's true that they are "no slip grip", they hold even through the night. They have a thin layer of silicone type stuff on one side that does not pull the hair out when I take it off. I have thick hair and these elastics are just right for me. The shades of blond elastics are really nice too.